Corbyn – So why does he seemingly have a downer on the poor and young folk? Well it’s the poor and the young who are going to suffer most from his and Teresa May’s policy of Brexit so for me it’s clear. 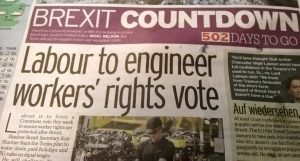 I know quite a number of Labour members and supporters and I can only recall one of them being a Brexiter, whats more recent polls seem to indicate that around 80% of Labour Party members oppose Brexit. For all his bluster Corbyn’s voting record over many years shows him to be very much a Brexiter, so no wonder Labour is in a pickle over the EU. But here’s the rub, many Labour supporters and indeed members are of the view that Corbyn is playing what they call a ‘long game’ and that he will eventually reveal himself as a Remainer. Trouble is having forced many reluctant Labour MP’s to vote with the Tories over Brexit time and again how on earth do you reverse such a stance and have any credibility at all? and it couldn’t be a more apt phrase to sum up the times that we live in because most of the time the opposite is true. These days, probably more than in the past, our politicians see themselves as doing the right thing by being loyal to their party and what it tells them to do and how to vote. Only rarely will a brave few break ranks and defy their party. Looking at it more cynically though most MP’s these days are career politicians so voting the way they are told ensures that they get reselected so keeping their job. Recently 12 Conservative MP’s stood up and very publicly voted against their party in a crucial Brexit vote, a vote where, for once, Labour did not back our disgraced and shambolic Bluekip government over Brexit. The MP, according to the i newspaper, was John Stevenson. To me he inadvertently opened a window on a world where loyalty to a political party is much of the time more important than the common good and it sums up how weak our politicians have become. Where are the rebels of the past who would not be whipped? Where are the political leaders who would do the right thing rather than what’s in the best interests of their party political sect? Yes a few Tory MP’s had been whipped once too often on this occasion but there has been vote after vote over Brexit where both Labour and the Tory Parties have whipped their MP’s to vote the pro-Brexit party line. Yes there have been Labour rebels too over Brexit (around 40 last time) but how many MP’s from both the main parties would have voted differently over Brexit if they had not been whipped? Surely, we want our MP’s to be more free thinking individuals who whilst coalescing around the core beliefs of their chosen political party are quite happy to say ‘no’ when that party asks them to vote in a way they don’t agree with. Well that is what we want is it not? That our Bluekip Government, propped up by the right wing DUP, have been driving us ever nearer to the Brexit cliff edge is bad enough but with Labour embarrassingly hanging on to May’s Brexit shambles of a coattail is just too much. Yes I know Labour’s right wing working class supporters mainly voted for Brexit but the sad fact is that they, being amongst the poorest in our society, will in all probability come of worst when May (together with Corbyn?) really do jump off that Brexit cliff. Have Labour forgotten that the Official Opposition is there to oppose – it’s what our democratic processes have been all about for donkey’s years! 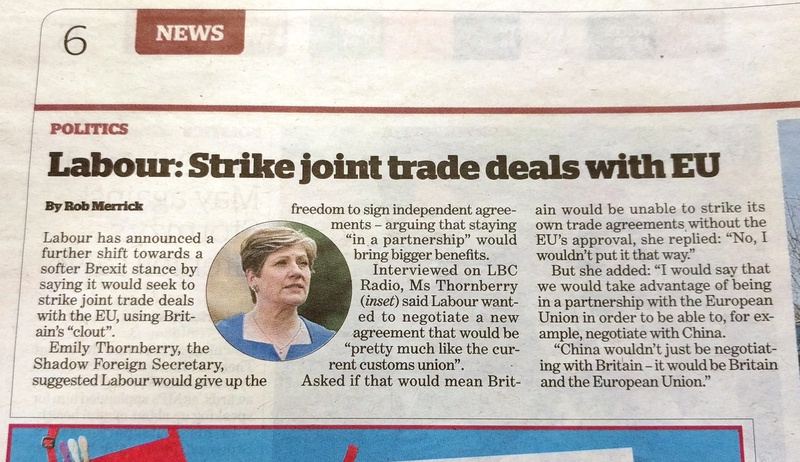 The point being that Labour’s Keir Starmer is trying to amend Tory legislation so that workers rights are protected when Brexit hits us because those rights are under great threat from Brexiters who are using the EU Referendum result to attack them. 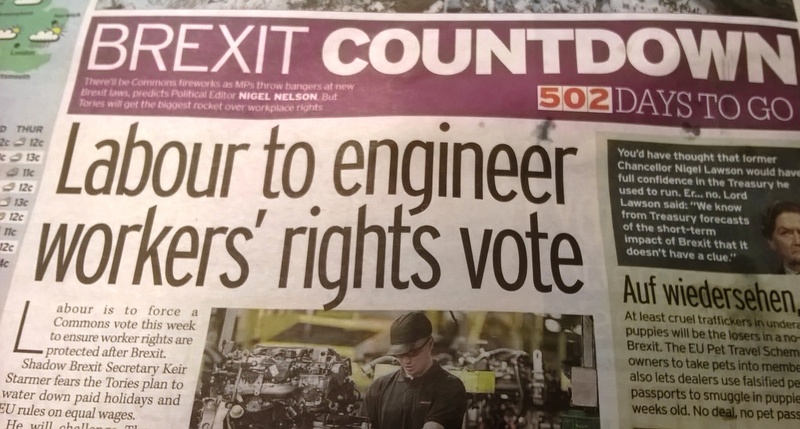 It’s not that Starmer is wrong to try to amend the legislation but what is wrong is that Labour continues to back Brexit which in turn presents our Bluekip/DUP Government with the opportunity to bash workers rights! 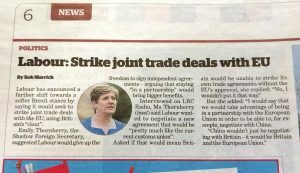 You really could not make this up, it’s as though Labour support the Brexit principle, despite the damage it’s going to do to us all (the poor in particular), but they plod on backing it whist trying to change the consequences of it. Have they not thought it’s time to stop backing the process that’s causing all the trouble in the first place?